In 2010 my Mum, who I was very close to, was diagnosed with lung cancer. By the time the doctors had found the disease, it had already metastasised to her liver and bones so as you can imagine, the prognosis was bleak. I was living in Cairns at the time and immediately came home to be with my family. It was meant to be a 10 day visit but I ended up staying and moving in with my parents to support them through this. It was a very emotional time for each member of my family and it felt like we were all just stumbled our way through each day. During this time, there was one part of my day that I continually craved and that was taking the dogs down to the park. My Mum’s dog Daisy, was 16 years old and totally geri (geriatric) and at the time my sister’s dog was living with my parents as they were renovating the house, his name was Roger. Every afternoon, the three of us would hop in the car and head down to the beautiful big reserve and oval near my parents place and we would walk. The dogs loved it because they were able to run around and indulge in all those delicious dog smells. I loved it because, I would take my shoes off and walk bare foot on the grass. It didn’t matter if it was warm or cool, I just had such a strong compulsion to feel the earth under my feet. The soft, cool grass was so therapeutic and every day I did this, I found a little bit of calm and peace in the chaos of my emotions. There was one day in particular, my parents were down south and I was meant to be going out to a party that afternoon. I had been feeling so sad and was really struggling to get though the day. I made the decision to not go to the party so rang my friend and told her. She was concerned about me being on my own and wanted to know how I was going to spend my afternoon. I told her, I was going to walk on the grass barefooted with the dogs. This did not seem to allay her fears very much but I knew in my heart, I just needed to ground myself to the Earth. I went to the park with the dogs, took my shoes off and started to walk. I knew with totally certainty that this was exactly what my spirit need that day. At this point, I didn’t know any of the science of grounding or Earthing but it all makes so much sense to me now. I stayed at the park, wandering in a massive loop around the edge of grass for over two hours. I came home feeling lighter and brighter than I had all day. According to Bare Foot Healing (www.barefoothealing.com.au), years of extensive research has shown that connecting to the Earth’s natural energy, by walking barefoot on grass, sand, dirt or rock can diminish chronic pain, fatigue and other ailments that plague so many people today. 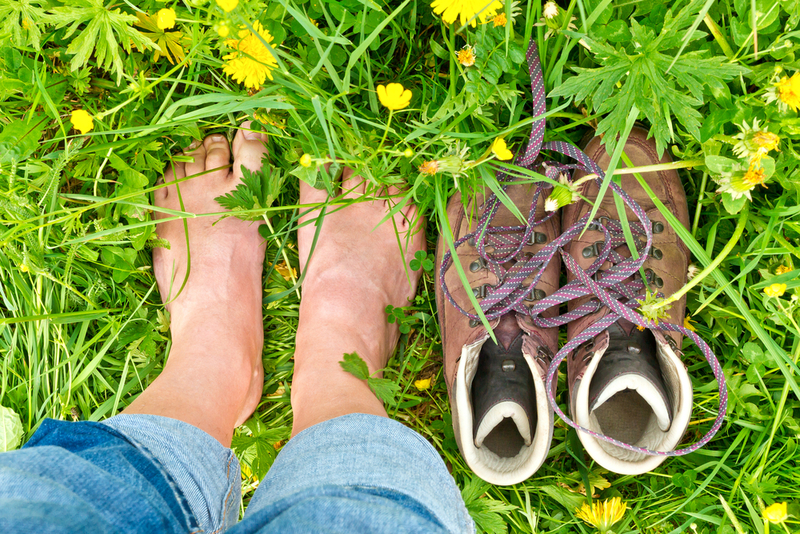 Quite simply, walking on the earth in bare feet is great for your health and vitality. When your bare feet or skin comes in contact with the earth, free electrons are taken up into the body. These electrons could be referred to as nature’s biggest antioxidants and help neutralise damaging excess free radicals that can lead to inflammation and disease in the body. The Earth is a conductor of free electrons and so are all living things on the planet, including us. The body is composed of mostly of water and minerals which in combination are excellent conductors of electrons from the Earth providing there is direct skin contact or some other conductive channel for them to flow through. So often we intuitively know what out body needs. It may show up as thirst, the desire for more sleep, a craving for plant based foods or a longing to get outside and walk on the earth in bare feet. My point is, trust your intuition and if you can acknowledge that inner whisper and guidance by giving your body what it wants then you are truly loving yourself in the most divine way. As I read more about Earthing or Grounding after my Mum passed, I realised why my desire to get out there every day had been so strong. I found comfort in that. If you are having a bad day or your health, energy or Spirit is depleted, give it a shot. Find yourself a patch of beautiful, green grass and walk on it for at least 30 minutes.